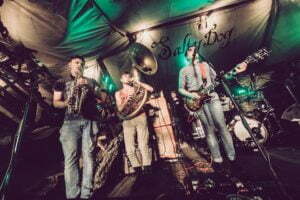 ‘Ben O’Dwyer met up with Booka Brass Band after they were announced for Trinity Ball. Joined by James Doherty (JD), Rónán Scarlett (RS) and Jack Marks (JM). The group discuss the experiences they’ve had so far, juggling college and music and what the future holds for Booka Brass Band. Your sound is very unique in Ireland, how did it all start? JD: Well, we all met through band camp.